Election Day, November 8, 2016, is right around the corner. The next president will decide whether the Supreme Court remains pro-business, or goes in another direction for a whole generation. The next Congress may tackle tax reform, and many other issues critical to the industry. Democrats are within four or five seats of retaking control of the U.S. Senate, and 40 or 50 races in the House of Representatives are extremely close. 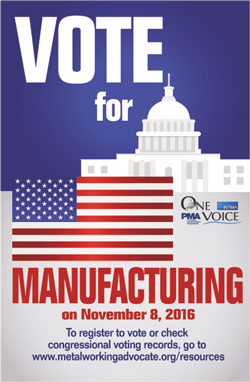 There is no doubt, manufacturers in all states are witnessing the most consequential election in years and must have their voices heard. Voter Registration and Early Voting Options—Help employees register to vote, find out if you can vote early and locate a polling location. Please visit the One Voice website for additional information about PMA’s advocacy efforts.